This DIY Storage Unit was built by Jennifer in Mooresville, Indiana for her daughter's college dorm room. Just as most dorms rooms, the room is not very big so Jennifer's daughter needed to make the most of every inch. Needing a solution to store personal items, books, and even food, Jennifer decided to built this tall, custom built vertical storage unit using Kee Klamp fittings and pipe. 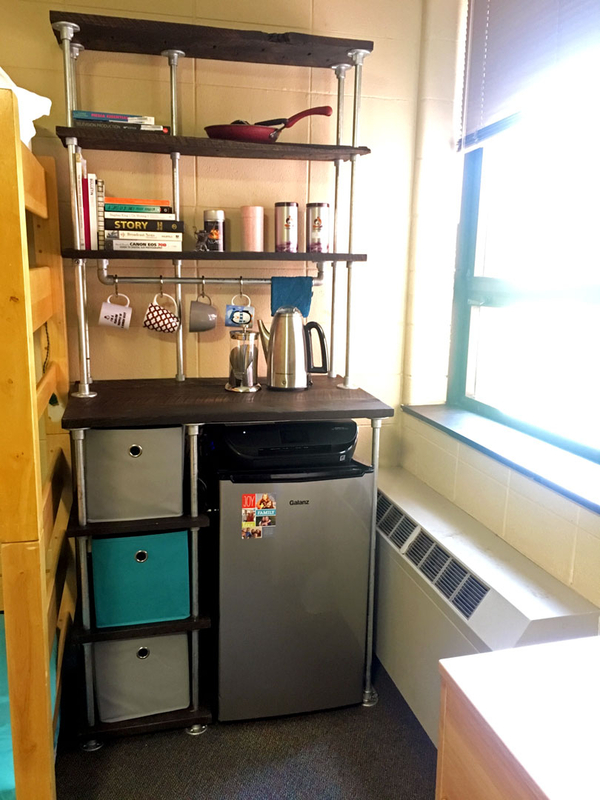 The fittings allowed Jennifer to create a custom design that fit perfectly in her daughter's dorm room and best of all, the entire structure can be easily taken apart and put back together (using only an Allen Wrench) when needed. Jennifer originally stumbled across the idea of building with pipe fittings after searching for bed ideas for her son using pipe and reclaimed barn wood. However, when it came time to build the storage unit, Jennifer immediately thought of Kee Klamp for the project. 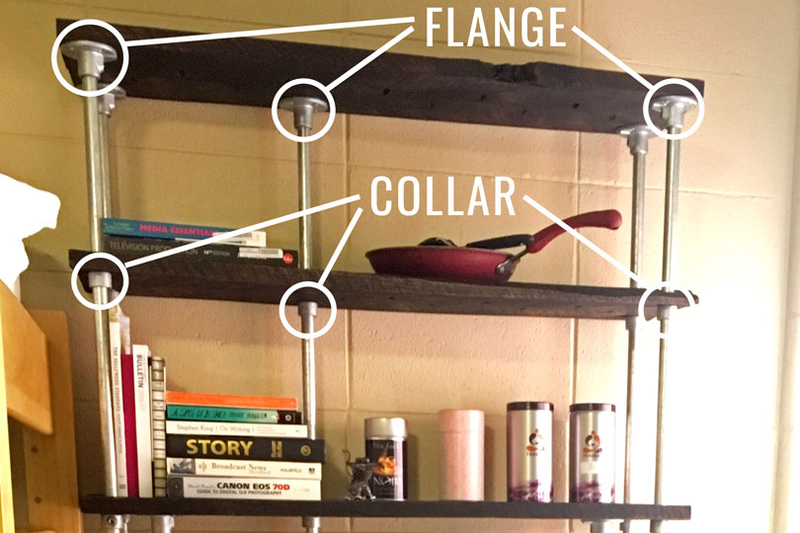 "I knew Kee Klamp was the right product for this dorm shelf because I wanted a strong piece of furniture that could be disassembled for transport and withstand college life and beyond." Building with Kee Klamp would allow Jennifer to create a custom storage unit specific to her exact needs and dimensions. 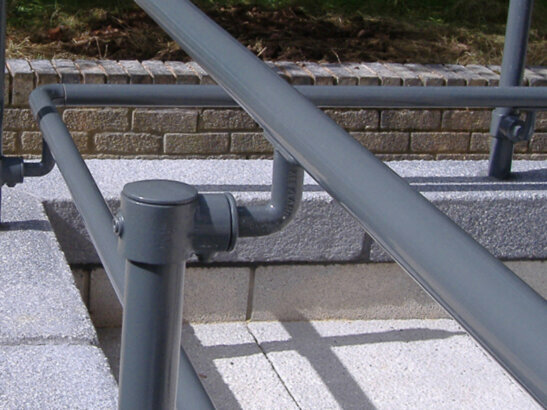 On top of that, since the fittings secure to pipe using a set screw, this allows the entire structure to be dissembled and reassembled. This will prove helpful when Jennifer's daughter leaves for Summer break, changes dorms rooms, and eventually graduates from college. Jennifer can rest assured knowing that the structure will stand up to abuse and multiple teardowns and setup over time. Making the unit much more valuable especially compared to most other cheaply built college dorm furniture. To create the storage unit shelves, Jennifer used wood boards from a local barn. These reclaimed boards help to create a unique look and one-of-a-kind design. "The shelves are made from wood from a local barn. I used a pocket hole jig to join the 4-6" planks together. The thickness of each board varied slightly. The collar Kee Klamp was perfect for this project because I could easily level themselves by adjusting each corner as needed." Overall, Jennifer and her daughter have been very happy with the custom storage unit. 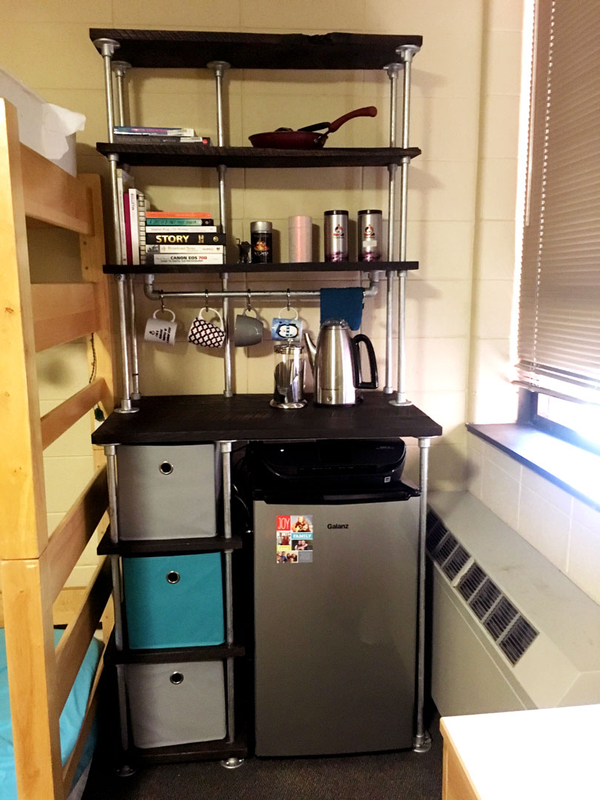 "I built the 'ultimate dorm room storage unit'. My daughter needed a place to keep her fridge, printer, books, dishes, supplies, etc. and then she said, 'It'd be great if I could have a coffee bar too'. So I designed the unit for her fridge and printer to be stored on one side and 6 fabric cubes to the side. Those factors determined the height of the counter. Then I added narrow shelves on top of the unit for her books and such." Jennifer's storage unit uses just three types of Kee Klamp fittings: the Flange fitting, the Collar fitting, and the 90 Degree Elbow. 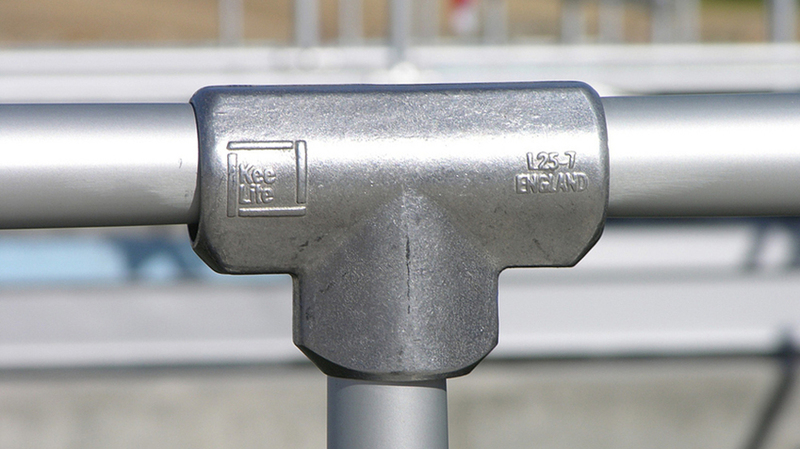 The Flange fitting is used to mount the top shelf and is used as the unit's "feet". This fitting has four countersunk holes in it for mounting. The storage unit uses five vertical sections of pipe on top of the "counter" and six vertical sections from the "counter" to the floor. All of these lengths of pipe are one solid section. These sections of pipe slide through a hole cut out in each shelf board. They are then held in place using the Collar fitting just below that shelf. This fitting allows pipe to slide through the fitting's open socket. 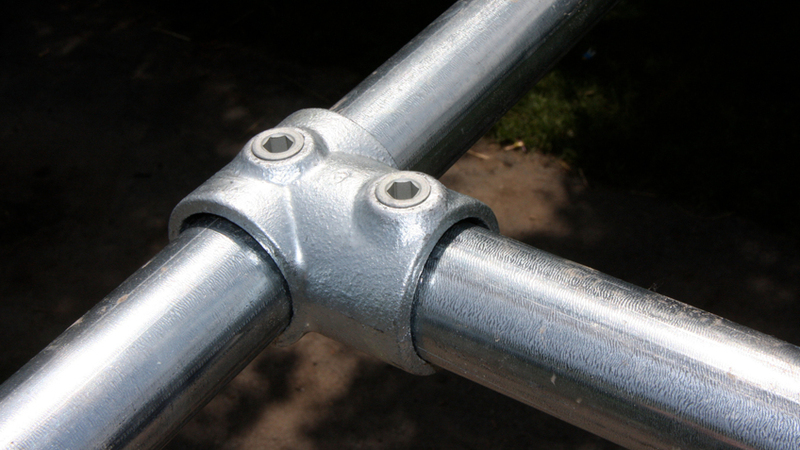 The height can then be set and secured by tightening the fitting's set screw. Lastly, a horizontal pipe is used for hanging coffee mugs. 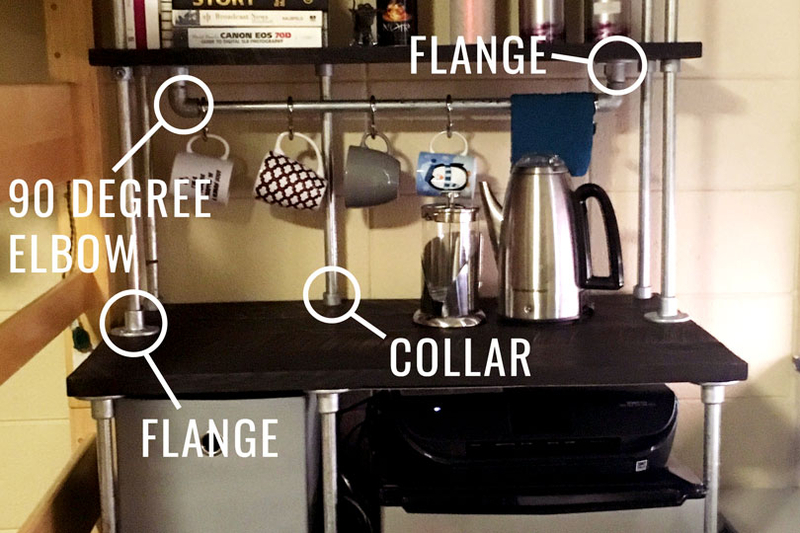 This bar is attached to a shelf using Flange fittings and the 90 Degree Elbow to change the direction of the pipe (allowing it to connect to the Flange fittings that connect to the bottom of the shelf). Well, that covers the details of Jennifer's custom storage unit. If you want to build one just like her, browse our wide selection of Kee Klamp fittings to find the right ones for your project. Also, if you need any help at all, please don't hesitate to reach out to our projects team. Our team is experienced in designing and building Kee Klamp built projects. From railings, to desks, to storage units, our team can help you come up with a design that is perfect for your specific needs. Get in touch by emailing projects@simplifiedbuilding.com or by heading over to our free design assistance page. 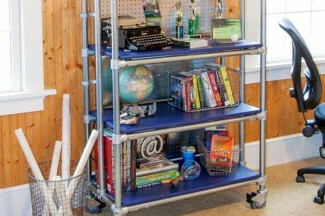 In this article, we're going this amazing rolling bookcase, what you'll need to build it, and the steps to put it together (with detailed diagrams). 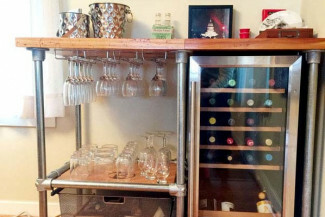 Follow along as we cover this industrial-style, DIY Beverage Cart, what you'll need to build it, and show you how to build your own (with steps and diagrams).